Copper Troughs and Cancer Reports – Johntheplantman's stories, musings, and gardening. I’ll start with the trough. My beautiful friend Lisa Landry owns and operates a delightful home décor shop on Broad Street in Rome, Georgia. She called me a couple of weeks ago and told me that she was preparing to move the shop to a location one block down and across the street. The problem is that I know what the feature will look like and we have a lion’s head to put on the brick wall for the water to come out of—we just don’t have the trough, Can you help us find one? Email me at wherdepony@bellsouth.net, leave a comment on the blog, or find me on face book—John Paul Schulz (Rome, Georgia). Thanks in advance. I wrote an article about Living and Giving the Christmas of 2011. CLICK HERE to see it. I’ll do another article on the shop after the move. I’m sure it will be amazing. And on to the cancer report. For background, I have been fighting cancer for several years. I had a laryngectomy (voice box removal) in September, 2012 A few months later I was fixed up with a button in my throat that I could push when I wanted to talk. It’s pretty cool. I am writing this on March 16, 2014, and a year ago I was going through radiation and chemo treatments for recurring tumors on my shoulder. Everything was tolerable and I got through it but it takes a long time to get over those treatments. I’m doing well but still recovering a year later. On January 28 of this year Dekie and I went to Emory in downtown Atlanta for a CT scan. I got the scan and we had a wonderful snow adventure in the form of an eleven hour trip home. (Click HERE to see the article about the trip). I didn’t tell anyone at the time, but we got a call that same afternoon from the doctor’s office that there was a lymph node abnormality in the scan and that I would need to get a PET scan the next week. That sort of information is a little bit scary, but my reaction, as always, was “Oh, well. I’ll do whatever has to be done.” The following week I had the PET scan and got the dreaded call that I would have to schedule for a complicated biopsy. At this point I just accepted the fact that I would have to go through more chemo. Dekie and I started adjusting our spring plans around possible treatments. Another snow storm in the Atlanta area postponed the biopsy until March 12, and last week I went in for a “trans-tracheal ultra-sound guided biopsy.” It was a bit complicated. They put me out for a while. The day before the biopsy, my friend at the bank said, “I sure do hope it comes out all right.” I told her that I was mentally prepared for bad results. She said, “John, that’s not your usual positive approach.” I explained that I figured if I set my mind on good results and they were bad, I had lost something somehow but if I accepted that they would be bad, then either I would be right if they were or totally elated if they weren’t. After the biopsy I was told that I would be notified in a few days. I had already accepted the possibility of chemo treatments. And, Friday afternoon the phone rang. It was the doctor’s office. I could barely say, “Thank you.” Tears ran down my face. I am still going through the mental process of accepting the fact that the results were indeed good and that I do not have to take the treatments. –An inspirational approach to reducing fear by facing cancer treatments with optimism and humor. YEA….I love good reports!!! talk soon and look forward to seeing the water feature and the TREE!!! Take the photo to a sheet metal shop. Copper may be a little dear for such an ambitious project, but they can suggest something affordable that can be given an ‘antique’ finish after they finish. Glad you shared your good news. Hope spring will be especially nice this year. Pingback: Feed Troughs and Redneck Philosophy | Johntheplantman's stories, musings, and gardening. Sorry I can’t help with the trough, but I can celebrate your wonderful news! By the time you reached the punch line, I was anxious! You do tell a good tale, John. I am SO happy for you and Dekie! Stay well, plant and create! Grace and peace be yours in abundance! PS Looking forward to your new book! Pingback: Assignment: Build a Rustic Water Trough Fountain on a Brick Wall | Johntheplantman's stories, musings, and gardening. 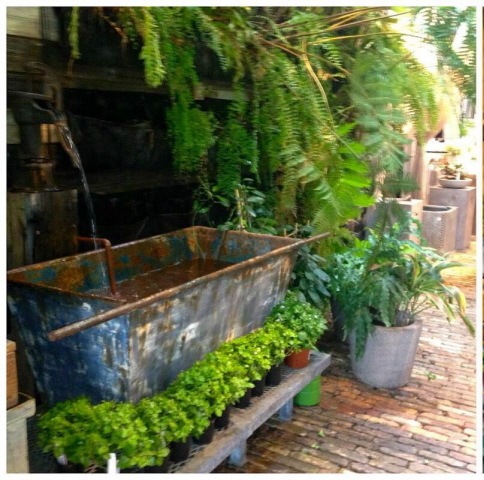 Pingback: Uncommon Garden and Gifts | Johntheplantman's stories, musings, and gardening.